EaseUS MobiMover is a professional tool to transfer contents from iOS device to computer, device to device and computer to device. Sometimes you may get the message “iTunes is needed to transfer data effectively. To download and install now, please click here” or "Your iTunes is not up to date. Click here to download the required latest iTunes now" when running EaseUS MobiMover on your computer. This issue is caused by the special cases listed below. 1. iTunes has not been installed on this computer. 2. iTunes is not the latest version. 3. iTunes was downloaded and installed from Microsoft Store. 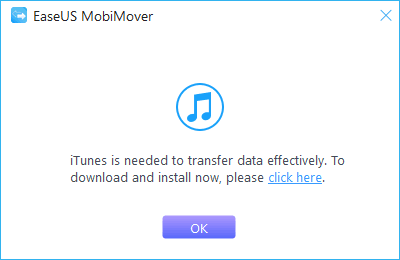 EaseUS MobiMover requires the interface and drivers of iTunes when transferring contents, thus it is not able to work when running on a Windows or Mac computer without the latest iTunes installed. 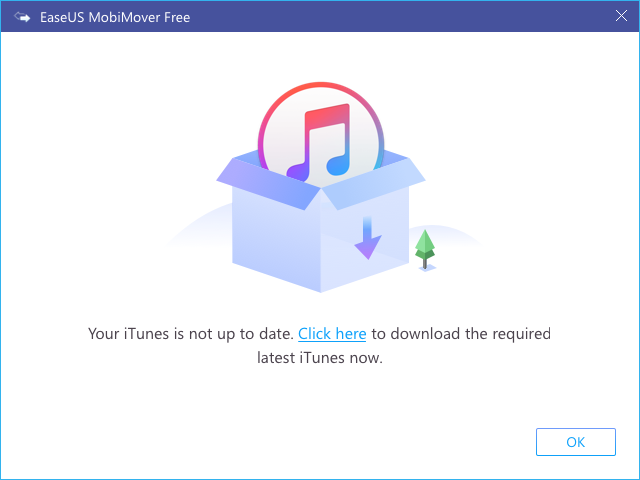 If you already have the latest iTunes on your computer but still receive this message, please confirm if you downloaded iTunes from Windows Store since currently, this version is not able to be recognized and supported in EaseUS MobiMover 4.0. To resolve the issue which is caused by the special case we described above, it would be recommended that you uninstall the installed Apple Driver (or iTunes for mac) from your computer, reboot the system, and download and install the version from the following links instead. If the issue still cannot be fixed by the solution, please contact Support to get a further help.